Redirection software that allows you to redirect data between these components: serial port RS232, mouse, USB, TCP Port, virtual keyboard and keyboard buffer. This software is perfect for barcode reader applications or other serial data capture devices having a standard RS232 serial interface and/or TCP Ethernet connection. To control protocol you can send answers to TCP and/or Serial Port. ° Lost or interrupted Bluetooth and USB device connections are restored automatically. 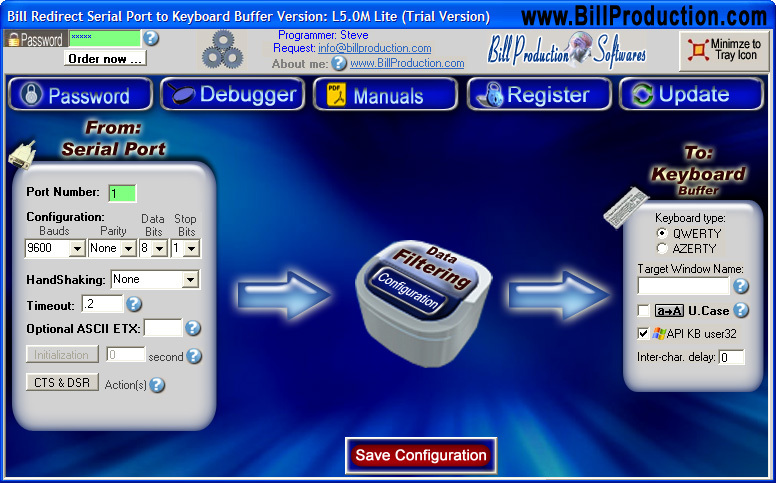 Allows creation of Virtual Keyboards: Each button key stands alone and can appear when related window is activated. Each button can send data to Keyboard buffer, TCP, Serial Port, Mouse and/or to a file. Possibility of change or add Buttons on a existing application. Perfect to control your TouchScreen application. 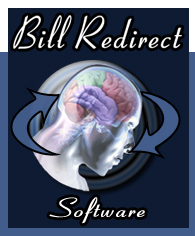 This free resident plugin software creates a real-time connection between BillRedirect and your Microsoft Excel. This free resident plugin software, opens a Serial Port connection with your serial peripheral and redirect the data to Bill Redirect software over a Ethernet TCP connection. With this solution, you can connect a serial peripheral on a computer and receive the data at another computer.